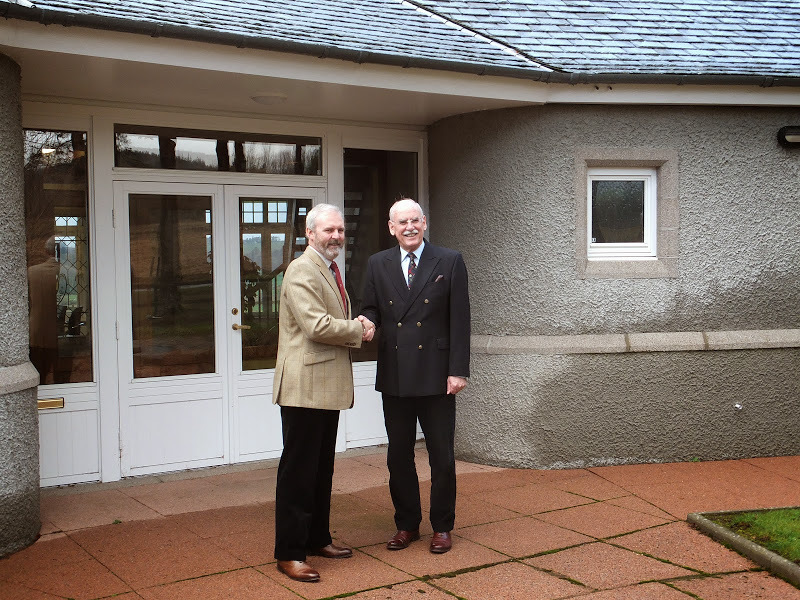 After nearly 11 years as the Administrator of the MacRobert Trust, based in Tarland, Air Commodore Bob Joseph, CBE RAF (Retd) leaves the hugely respected, estate-based charitable trust with both sadness and pride. “I have thoroughly enjoyed every minute of my time here at the Trust, made extremely good friends and been privileged to work with some amazing people, in the headquarters, on the estate and at Douneside House – Jan and I will never forget it” said Bob as he bade farewell to his management team at the Cromar offices. During his time at the helm he has overseen significant changes including monetary donations of over £8m and the direction of over £20m to the Trust’s many charitable interests. He and his wife, Jan, have so loved the local area that they have decided to stay and have moved into their new home in Aboyne. Air Commodore Bob has been succeeded in the newly re-designated Chief Executive Officer role by Rear Admiral Chris Hockley, CBE. “It is such a privilege to be given the opportunity to take the Trust on into its truly exciting future, for which Bob has provided such an excellent springboard – Kate and I are both looking forward to playing our full part, both on the estate and in the community.” he said. Rear Admiral Hockley joins the Trust after 37 years in the Royal Navy, a career that had him serving in ships, including all 3 aircraft carriers, the Ministry of Defence and in senior roles in Support and Fleet Commands. His last 2 appointments brought him to Scotland – firstly as Commanding Officer of the Faslane Naval Base on the Clyde, during which time he was appointed an Aide de Camp to Her Majesty the Queen, and then his last role as Flag Officer Scotland, Northern England and Northern Ireland and Flag Officer Reserves and Regional Forces. Rear Admiral Chris was appointed a Commander of the British Empire in the Queen’s New Year Honours list 2013 and, shortly before leaving the area, was also appointed as a Deputy Lord Lieutenant in the South Lanarkshire Lieutenancy. Chris married Kate in 2005 and they have 5 grown up children between them. He and Kate enjoy walking with their 2 dogs, boating and watching Rugby and Chris is a past President of the Royal Navy Amateur Fencing Association.